Rowed up the Hamble from Swanwick to the Horse and Jockey at Curbridge with members of the Dinghy Cruising Association today, and, since you ask, it was grey, cold and occasionally damp. I had the best of it really, as rowing keeps you warm and builds up an appetite even for British pub food. 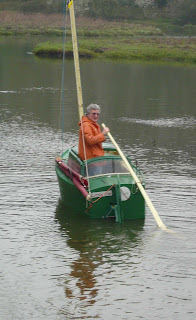 Alistair Law brought his Paradox Little Jim and demonstrated how to use the yuloh, or Chinese oar. Apparently it is easy as long as you practice for a few hours right at the beginning, rather than leave learning the skill until you need to negotiate a crowded harbour in a brisk wind. Al relies on his a lot, as his outboard is stowed forward rather than hung off the transom where it gets in the way. Liz Baker had outboard trouble so had to row, something that sailors hate, and was very late for lunch as a result. Al and I were coming back downstream when we met her, Liz's crew manfully (womanfully?) wielding the oars. That's Al in the background, having set sail.